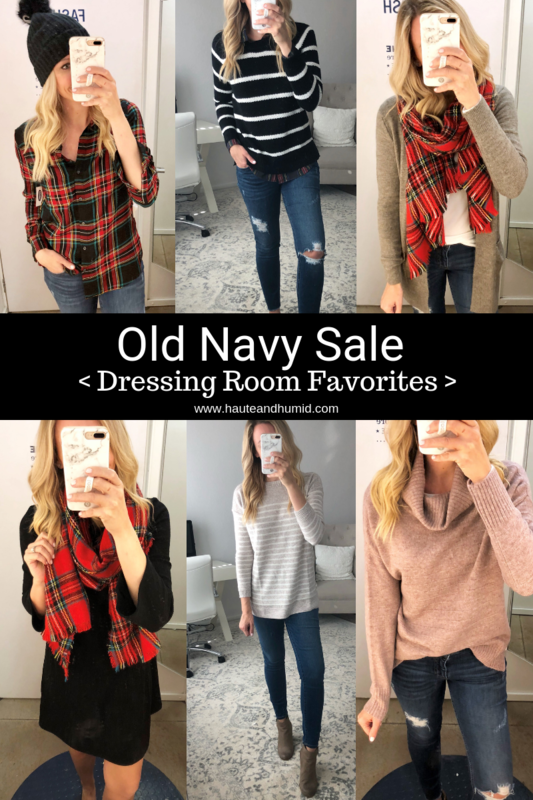 I’m totally jazzed about this post because Old Navy has been having some amazing sales. Old Navy delivered big time with some really cute, well made, practical items. Be sure to stock up on your family Christmas pajamas too! These gain more popularity every year and sell out quickly! I will like a few of my fall favorites at the bottom. A lot of sizes are selling out quickly. I prefer to buy online and make any returns in store OR buy online and pick up in store which is really convenient if you need a piece ASAP. For reference below are all the shoes and booties I wore throughout the post. All of them fit true to size. Sweater- Wearing Medium, it was a tad big but I liked the slouchy look of it. 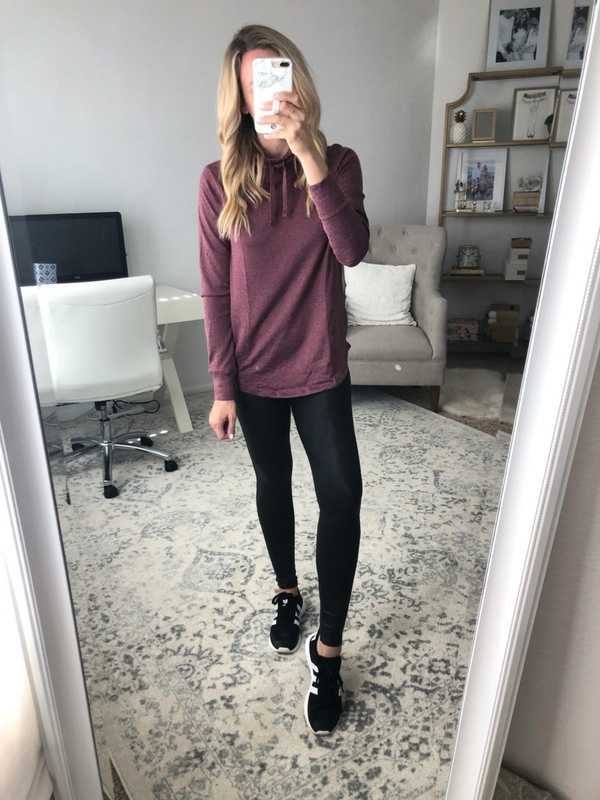 This sweater was just restocked and I ordered 2 because I loved it so much! I bought the grey and pink. 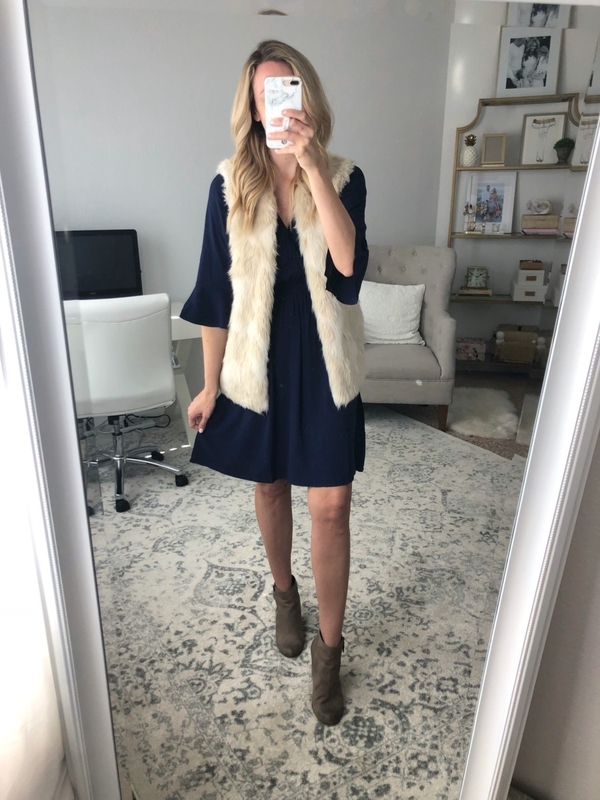 BELL SLEEVE DRESS– This dress fits true to size and a definite keeper for me. This is perfect for Thanksgiving or Christmas. The waist is cinched but elastic so it is very comfortable. It has functional buttons and the cutest ruffle collar. 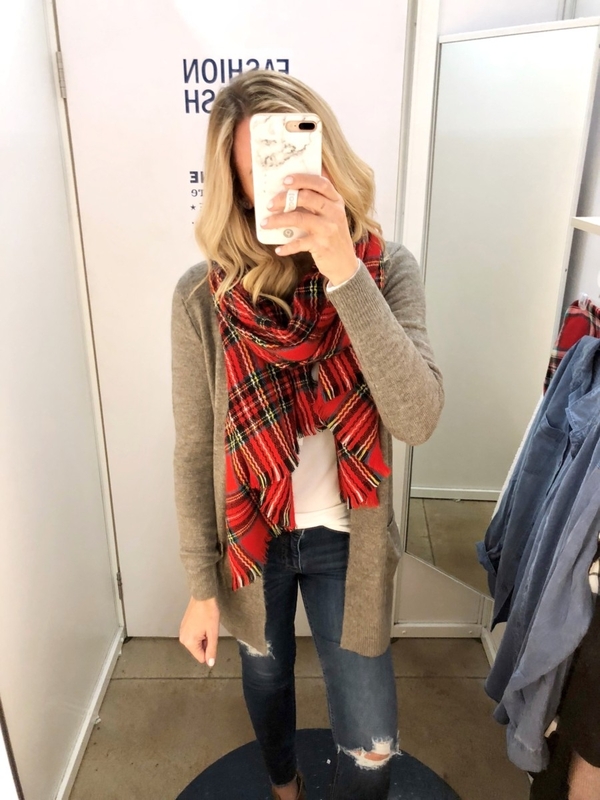 PLAID SCARF– Love the neutral colors in this scarf. It is very soft and will match just about anything. My store did not have a lot of dresses but these are some of my favorites! FUNNEL NECK TUNIC– Total keeper! It runs true to size and has thumb holes. Don’t you feel like thumb holes are the new pocket?!? This pullover is fleece lined and long enough to cover the bum. 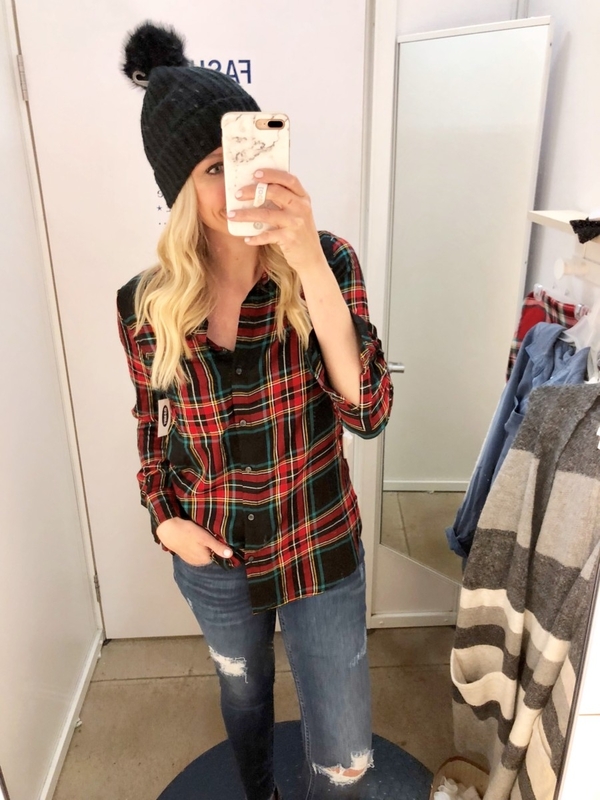 TARTAN BUTTON UP– All the Yes’s! Tartan is going to be huge this season and I can’t get enough. 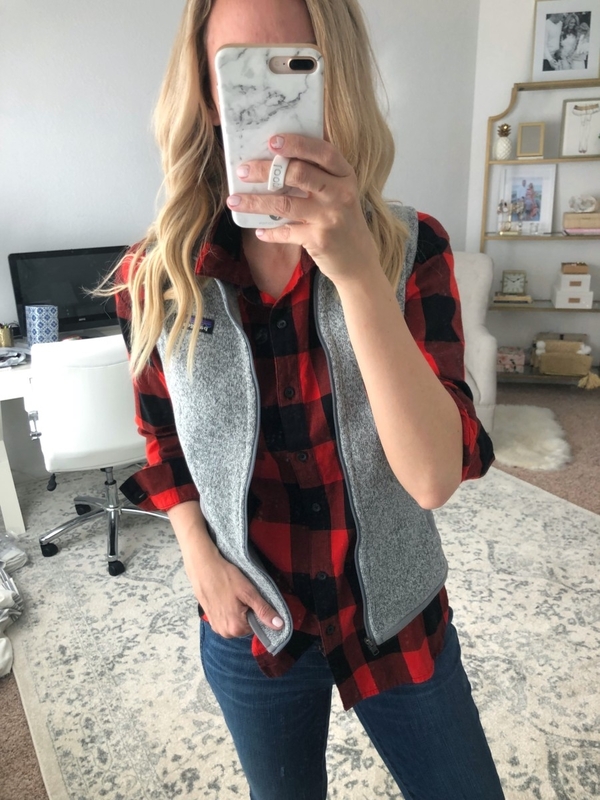 This button front top was lightweight which makes it perfect for layering with vests, sweaters or pullovers. FAUX POM BEANIE– I just love a beanie when the temps are cold. I don’t have to do my hair and I still look cute! This one was soft and I can’t pass up a faux pompom. KNIT SWEATER– These sweaters are great quality! I like that each side has a notch so it fits over your hips and doesn’t bunch up with you raise your arms. They come in a variety of colors and run true to size. Wearing a small. 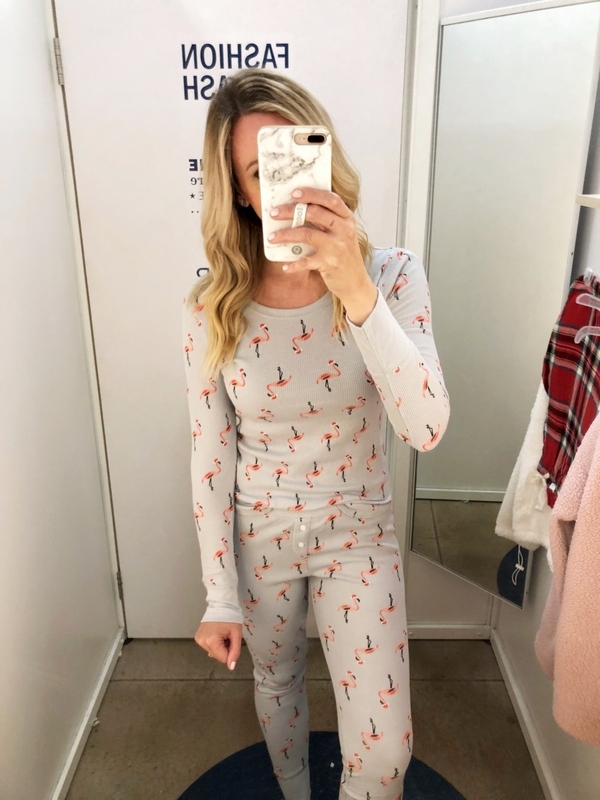 FLAMINGO SANTA PAJAMAS– My friend sent me a pic of these on our group text and they were adorable! The pants fit true to size (wearing a small) but I would definitely size up 2 sizes in the top. If flamingos aren’t you thang then there are about 10 other patterns to pick from. 1/4 ZIP PULLOVER– So many of the pullovers I have seen now days are $$$. While I love those pullovers, sometimes the bank account doesn’t. This is a great budget friendly alternative. It runs true to size but if you want to layer it I would suggest sizing up. WHITE LONG SLEEVE TEE– These are great slinky white tees for layering under pullovers, sweaters, vests etc. They are more of a jersey material than a regular cotton tee. I did size up to a medium in these. 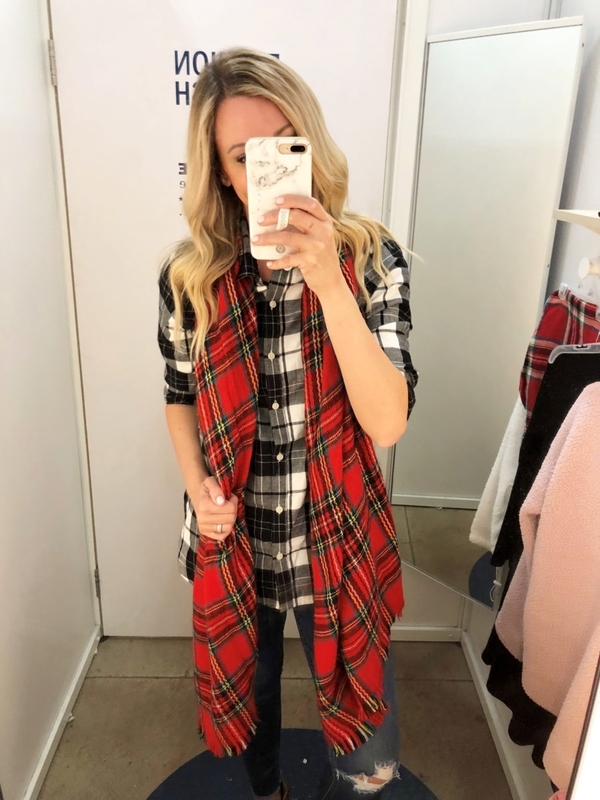 TARTAN SCARF– Oh tartan, get on my body! I am bound and determined to buy it all! This scarf is so festive and can fill any Grinch heart with Christmas cheer. 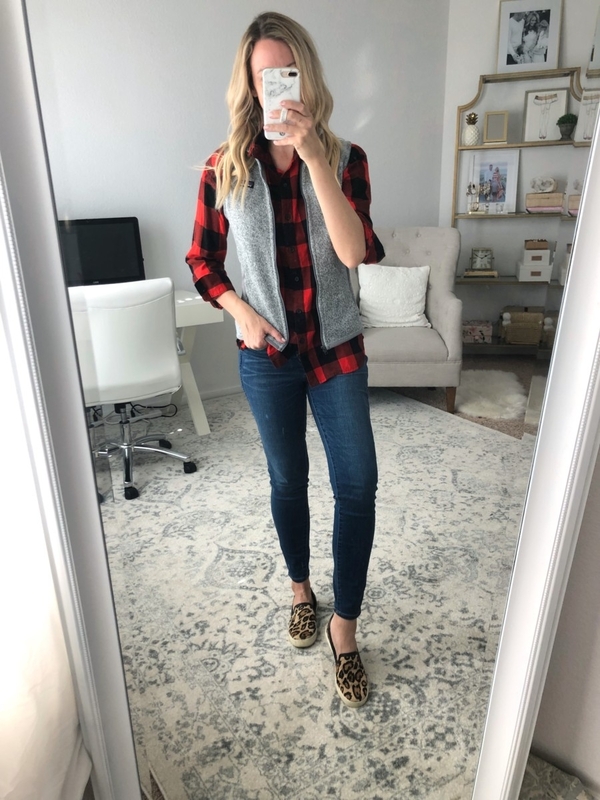 CARDIGAN– If you love the Madewell cardigans but don’t love the almost $100 price tag, this is one of the best dupes I’ve found. It is soft and the colors match almost exactly! BLACK & WHITE PLAID BUTTON UP– This is just like the black and red tartan button up above. These are great for layering and I love the longer length. 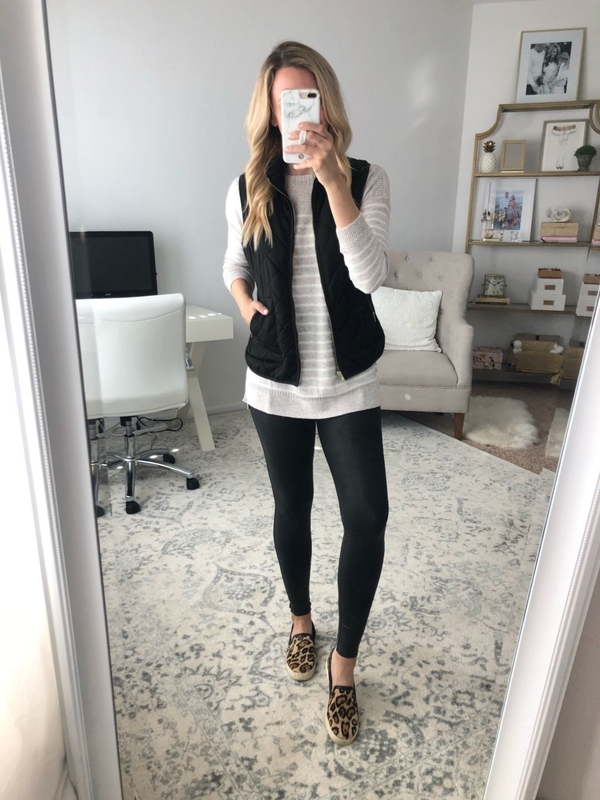 PUFFER VEST– This puffer is a little thicker than the typical quilted puffer. I loved the color options and how soft and plush these vests were. True to size. 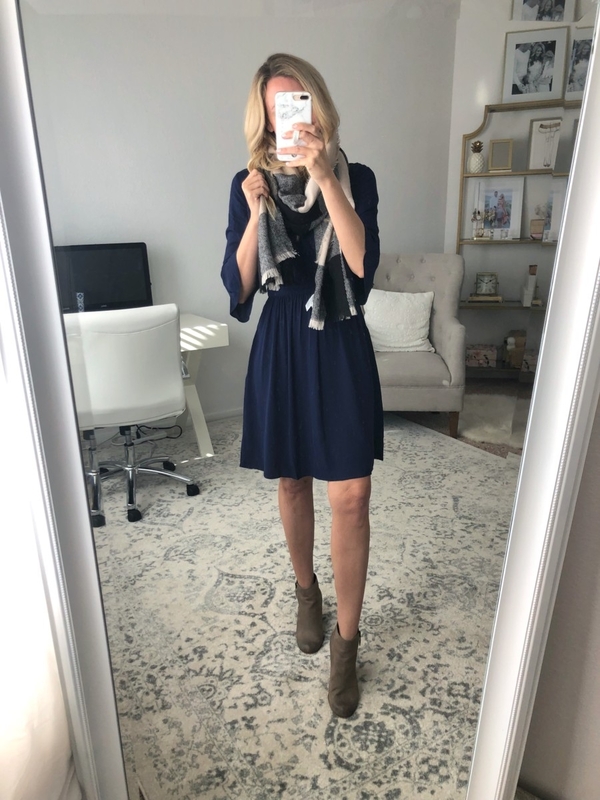 SWING DRESS– I love a good swing dress! These jersey swing dresses are beyond comfy. They almost feel like you are wearing an nightgown! There are a million different ways you can style these dresses. I paired the striped one with a jersey vest that is also lightweight and swingy. They do run true to size. 1/2 ZIP PULLOVER– OOOh this one was cozy! It has an adjustable elastic waist band. If you want a more fitted look I would size down. Wearing a small in this picture. 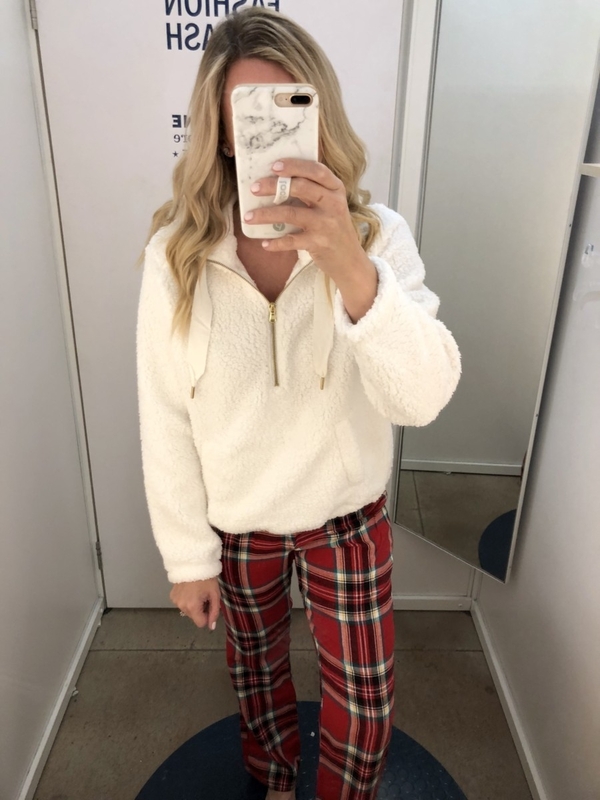 PLAID PJ PANTS– I love a good pair of festive pj pants. Christmas pj’s sell out really quickly so scoop yours up before they sell out. These run true to size. 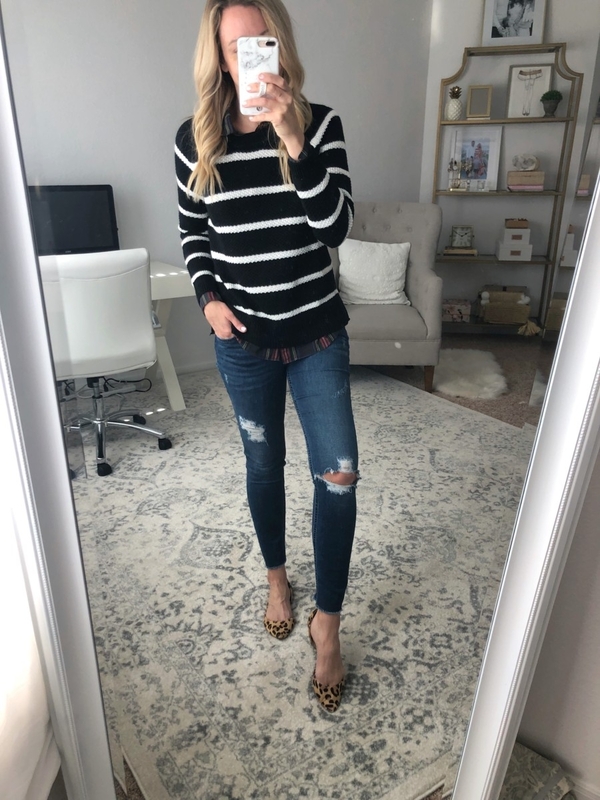 STRIPED SWEATER– This is the perfect sweater for a casual Thanksgiving. If orange isn’t your fave then check out the other color options. This sweater is really soft and not over thick. It runs true to size. RAIN COAT– Will it ever quit raining in Texas? Probably not! I bought an expensive name brand rain coat earlier in the year and returned it after finding this one. It is the perfect length, weight and not too bulky. It comes in two other colors. Wearing a small here. PLUSH KNIT TEE– These shirts are so nice! It’s like a fleece and a tee shirt had a baby and made this top. Ultra soft and comfy! If you have a larger chest or want a less fitted look, I suggest sizing up. 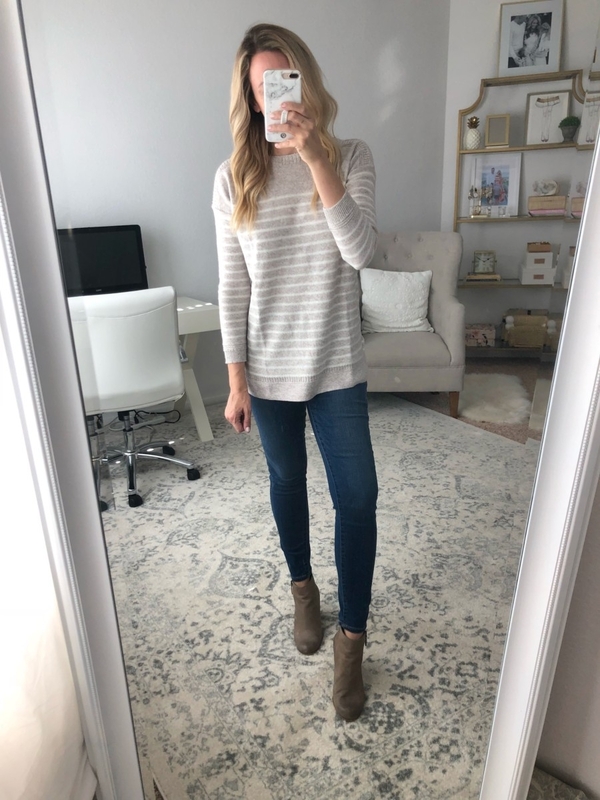 STRIPED TUNIC SWEATER– This one is a keeper. Again, very soft but I love the stripes, color and length. Anytime I can do double duty and pair a top with jeans and leggings it has found a place in my closet. Runs true to size. 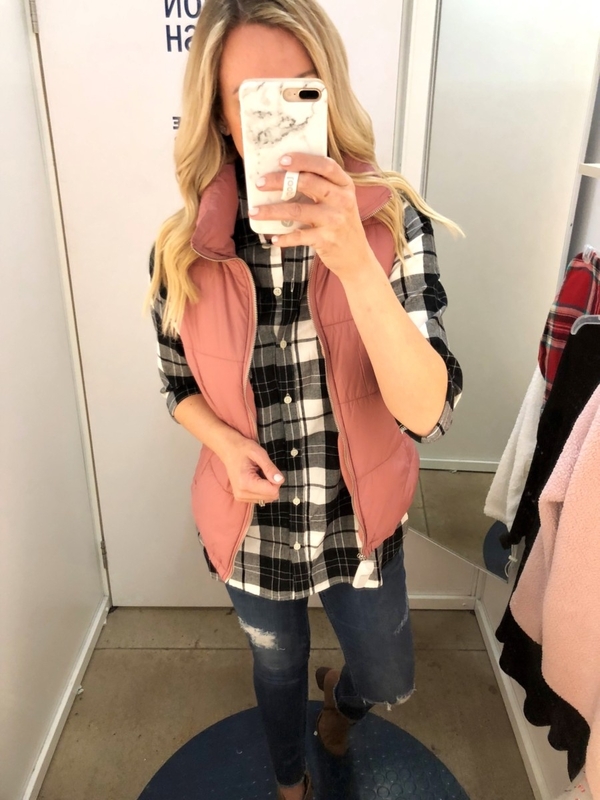 THIN PUFFER VEST– If you weren’t sure about the bulk of the previous puffer or live where it doesn’t get super cold then this lightweight quilted puffer is your gal. 1.Break up the pattern with a necklace, vest or jacket. I added my favorite Patagonia Vest. 2. Add another pattern. I added leopard shoes to make the shirt less country and more trendy. 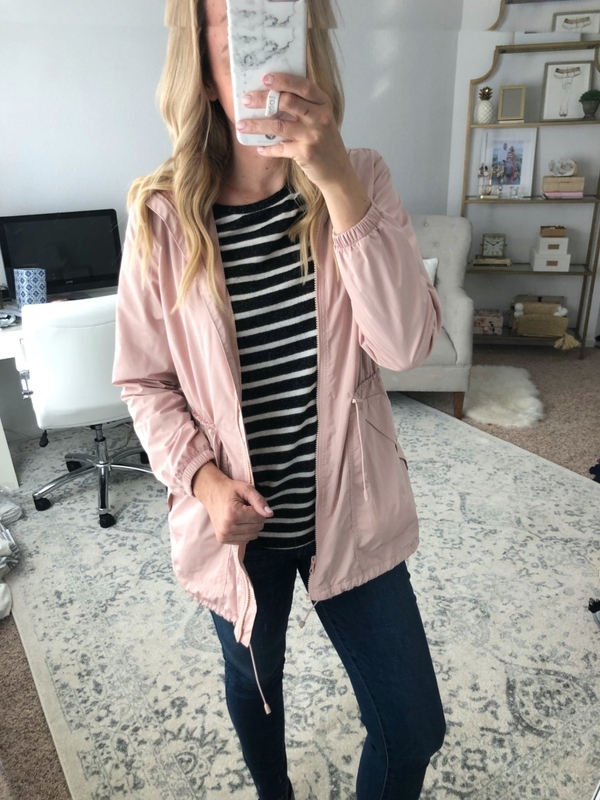 Loving this Old Navy fall favorites feature? 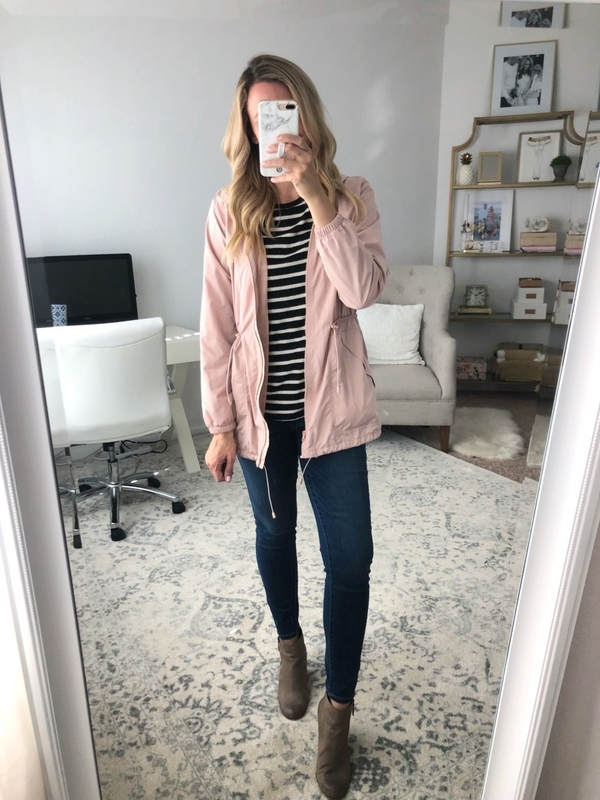 Take a look here for more of my fashion favorites!